Explain the efforts of some Dominicans and Franciscans who protested against the brutal treatments of the natives. How did the ideas of the Franciscan Bartolome de las Casas lead directly to the enslavement of Africans and their coming to the Americas? It’s sad that Christian mission went forward hand in hand with military dominance and exploitation of the native peoples. Part of the justification seemed to be that it was part of a “crusade,” so brutal treatment of the people they were to save or enlighten was under divine cover. Even so, this contradiction was apparent to Dominicans and Franciscans when they realized the hypocrisy of bringing Jesus’s love with brutal enslavement. Franciscan Bartolome de las Casas was himself a plantation owner, and having been convicted by a Dominican sermon saw the error of his ways. Unfortunately, their national economy was tied into the plantations which required cheep labor. The solution to protect the native American people was almost elegant – import slaves from Africa. Sadly, this is a trend of cultural bias- the assumption that one’s own people and culture is superior to others, that other peoples are less advanced and their culture inferior. Although the view that the native American people have value and should not be exploited was extraordinarily enlightened, there was still the trap that other people half a world away were of less value and okay to be enslaved. Another assumption was that non-believers were less and so it was okay to be treated with less exploitation and slavery. The thought that all people had high value and loved by God regardless if they were believers was not yet embraced. 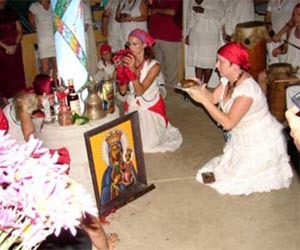 Explain how native African beliefs mixed with Catholicism to form syncretistic variations like voodoo in French Haiti, Candomble in Brazil, and the Santeria of Cuba. The incorporation and adoption of indigenous cultural motifs are hardly a recent phenomenon nor are exclusively relegated to the domains of African and Latin American societies. Much of contemporary Christian worship as observed in the West is heavily borrowed from pre-existing traditions and observances that are foreign to the Bible. If the truth be told, we Christians in America and Europe hardly bother to ask why we worship the way we do in church. We are encouraged to read our Bibles, but we are also conditioned to read the Bible with the lens handed to us by the Christian tradition to which we all belong. We carry out our religious traditions without asking where they came from. Surprisingly much of what we do for church service was lifted directly out of pagan culture in the post-apostolic period. As one prominent church historian put it, 4th century Christianity “absorbed and Christianized pagan religious ideas and practices, seeing itself as the fulfillment to which earlier religions had dimly pointed.” Worship of Greek and Roman pagan gods and goddesses dominated the Roman Empire until the end of the fourth century when Emperor Constantine designated Christianity to be the official religion of Rome. Although Constantine abolished paganism throughout the empire, Christianity had absorbed many of its elements. Early first and second century Christians never had sacred objects, sacred spaces, or sacred priests. In fact, the early Christians had no need for temples to meet, but instead met in homes, courtyards, or in isolated sites. Sometime in the 3rd century a gradual shift occurred in Western Christianity where Christians began adopting the pagan view of revering the dead and honoring the memory of martyrs. Hence the beginning of prayers for saints. This was followed by having meals in honor of the dead. The first three centuries following the apostolic period was marked by intense persecution of Christians throughout the Roman Empire and during the years preceding Constantine Christians began meeting in cemeteries to share a meal and commemorate martyrs who died in defense of their faith. These burial places came to be seen as “holy places” and Christians began to build small monuments over these spaces, which then turned to shrines particularly over the graves of famous saints. Soon art became associated with sacred spaces and the use of visual arts in worship began to emerge. If you remember reading in one the earlier chapters in McCulloch’s book, the cross as an artistic reference for Christ’s death cannot be found prior to the time of Constantine. Sometime in the 3rd century Christian communities began to venerate the bones of saints, seeing them as holy and sacred. 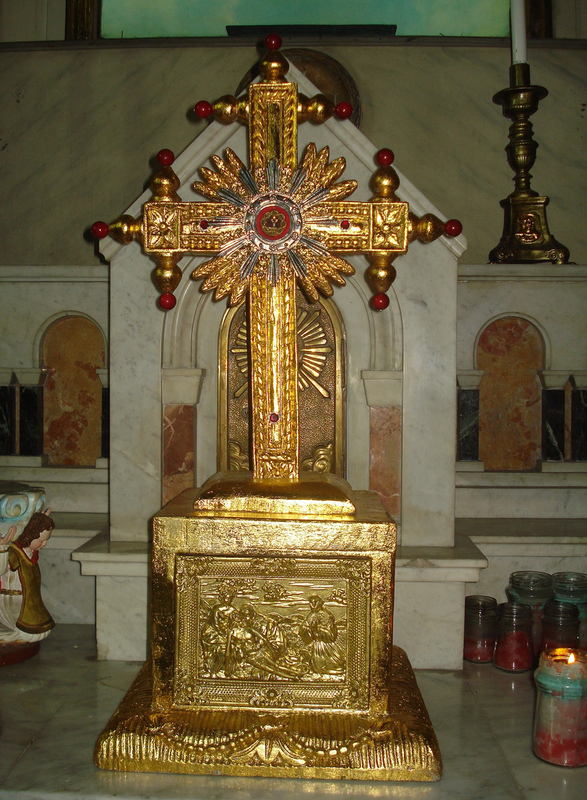 This eventually gave birth to relic collecting, which is still practiced in various Roman Catholic parishes. Reverence for the dead was a powerful tradition not only in ancient Roman pagan religions, but in the pagan religions of Babylon, Persia, and Egypt. Soon enough Christians began adopting this practice into their faith. At the same time there was also a shift in how the Lord’s Supper was viewed. Initially the Lord’s Supper was often a communal meal, which gradually devolved into a stylized ceremony called Holy Communion. By the 4th century, the cup and the bread were seen as producing a sense of awe, dread, and mystery. It isn’t surprising then as churches began to place a canopy over the altar table where the bread and cup sat. Over time rails were placed upon the altar table, which signified that the altar table was a holy object to be handled by holy and divinely selected people whom we would come to know as clergymen. Many of the largest church buildings were also built over the tombs of dead martyrs. This practice was based on the idea that the martyrs had the same powers they once ascribed to the gods of paganism. Some of the most famous Christian “holy spaces” include St. Peter’s Basilica on the Vatican Hill (built over the supposed tomb of Peter), St. Paul’s Church (built over the supposed tomb of Paul), the dazzling and astonishing Church of the Holy Sepulcher in Jerusalem (built over the supposed tomb of Christ), and the Church of the Nativity in Bethlehem (built over the supposed cave of Jesus’s birth). In the duration of Constantine’s rule, over nine major church edifices were built in Rome and in parts of Jerusalem, Bethlehem, and Constantinople. In just over three hundred years not only do you have sacred spaces and sacred objects, but also a sacred priesthood. The point of all this history is to show that religious syncretism is not unique to Africa, South America, and Asia. It would be wrong to lambast Africans, Asians and Latin Americans for applying their indigenous cultural artifacts into Christianity when the history of the Western Church shows how much it has in fact done the same. All of this summarization goes to show that the early Christians have assimilate the magical and mystical mind-set that characterized pagan thinking, and almost everything that is done in our contemporary churches has no basis in the Bible. The call to follow the “pure Word of God” often is betrayed how we actually come to worship in the contemporary churches. During this time, Japan was split between rival feudal lords. Many of them saw Christianity as a useful way of attracting Portuguese trade as well as furthering their own political aims. The powerful Tokugawa family initially encouraged missionary activity. However, by 1600, the Tokugawa had assumed control of Japan and began to see Christianity as a threat to their power. They were most likely aware of how other countries fell to power under Christian empires. For instance, the Philippines had fallen under Spanish control after Augustinian missionary activity had preceded the arrival of King Philip’s ships. (loc. 13718) Things began deteriorating for Christianity in Japan after Franciscan friars arrived in Japan in 1593 to establish a missionary presence. They made a fatal blunder by adopting an aggressively negative attitude towards Japanese culture, which led many to be executed. In the early seventeenth century, the Tokugawa expelled Europeans from Japan except for one policed trading post. They then launched one of the most brutal persecutions in Christian history. Many were executed and or crucified for being Christian. One of the notorious “tests” they conducted for Christians to renounce their faith was to step on or walk over pictures of Jesus or the Virgin Mary. Furthermore, Protestant Dutch merchants, who wanted to sabotage Portuguese power in eastern Asia, aided the Tokugawa in persecuting Japanese Christians. (loc. 13727) The Japanese Christian population was reduced to a tiny and half-instructed remnant. It wasn’t until 1859 when a treaty was signed with France allowing limited liberty of worship that Catholic missions re-entered Japan; there they found thousands of Christians in small local communities who had passed on their faith without priests or education for over 200 years. The Jesuits were shrewd in dealing with the Japanese. Instead of condescending their culture and imposing how superior Western culture was over and against the Japanese, they took on a more “incarnational” missionary approach, as they did with China. Just as Jesus incarnated and accommodated the Jewish culture of his time to gain followers and propagate his gospel message to others, so too were the Jesuit missionaries following Jesus’ example theologically and missionally, something we should bear in mind with our daily lives as well. (It was a practice Franciscans and Dominicans disliked and complained to the pope to denounce the practice.) They also utilized local trade and Portuguese businesses to invest in their missionary activities as well. However, the fear of being swallowed up by a Western or a foreign power was not in the plans for those in political control in Japan. Much of the missionary success in India and Asia was accomplished due to Iberian military backing. One of the realities was the need for a military presence to protect and advance your interests. Presenting the Christian message without military backing posed considerable problems for a missionary priest. Many in Asia were profoundly skeptical that Westerners could teach the East anything of value. (loc. 13622) It is doubtful that the Portuguese empire wanted to take the risk of engaging in a long, expensive, and costly war with the Japanese Empire which also had a strong military history.